The driving forces of Berger Paints - reflect the very spirit of its founder Lewis Berger - who laid the foundations of brand Berger way back in 1760 in the UK. With modest beginnings in India in 1923, today, Berger Paints India Limited is the second largest paint company in the country with a consistent track record of being one of the fastest growing paint companies, quarter on quarter, for the past few years. Company Profile Undergoing a number of changes in ownership and nomenclature in its 88 year old history in India, the company has come a long way. Starting out as Hadfield's (India) Limited, it had just one factory in Howrah, West Bengal. By the close of 1947, Hadfield's was acquired by British Paints (Holdings) Limited, UK and came to be known as British Paints (India) Limited. In 1983, the name of the Company was changed to Berger Paints India Limited. Currently, the majority stake is with the Delhi based Dhingra brothers. Berger Paints has established itself through a long course of time. 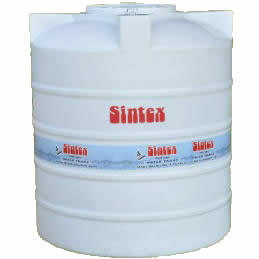 Sintex Loft tank for household use premium water tank 100% virgin material FDA grade material Multipurpose usage Stylish design Suitable where space is a constraint Double-lid, White Loft Tank is meant only for indoor installation. Available from selected factories.